Of all the major currencies the weakest today is the British pound. The Bank of England caught the market by surprise with their dovishness last week and the market believes that this week’s economic reports will reinforce their concerns. 1.3000 is a very important resistance level for GBP/USD and without a hawkish BoE, the currency pair may have a difficult time exceeding this rate. Although we believe most of this week’s U.K. economic reports will beat, investors could eye these reports with caution. We don’t expect to be in the GBP/JPY trade for long and will reevaluate before tomorrow’s UK inflation reports. We have chosen to sell GBP vs. USD/JPY because U.S. data continues to miss. Manufacturing activity in the NY region turned negative in the month of May and this follows Friday’s softer retail sales and inflation reports. 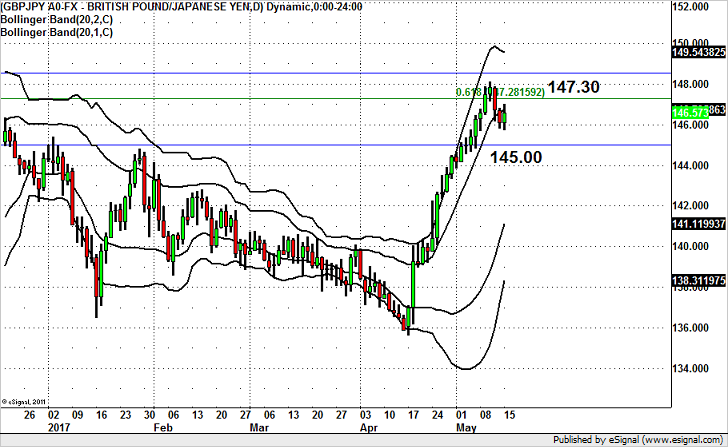 Rate hike expectations have fallen to 93.8% form 100% as a result and this could lead to further weakness in USD/JPY.